An Intrahepatic mass was found in a 65 year old Chinese female who came to our center for a routine ultrasound exam. MRI showed a lesion in her left lobe of the liver. Surgical records revealed a history of splenomegaly in conjunction with cirrhosis due to hepatic schistosomiasis, for which she underwent surgery (splenectomy) at age 20. On abdominal computed tomography scan, a 4.2 × 5.6 cm sized focal bulging mass at the left lobe of the liver was noted occupying segments 2 and 3 (Couinaud classification). A partial hemi resection of the liver segments 2 and 3 was performed under laparoscopy and specimen was sent for pathological analysis. Frozen intraoperative section confirmed splenic tissue as opposed to liver tumor. Further pathologic assessment revealed normal splenic tissue adjacent to liver tissue with a cavernous hemangioma and small focal necrotic lesions. The patient was diagnosed with hepatic splenosis with cavernous hemangioma within the spleen. The spleen was reported functional on histochemical analysis. Intrahepatic splenosis (IHS), Hepatocellular carcinoma, Hepatic schistosomiasis, Cirrhosis, Cavernous Hemangioma, Splenic hemangioma. Splenosis is an acquired condition defined as autotransplantation of viable splenic tissue throughout different anatomic compartments of the body. It occurs after traumatic, iatrogenic rupture of the spleen or post splenectomy. Cavernous hemangioma of the spleen is a rare disorder with fewer than 100 cases reported . Here we report a patient with a 45 year post splenectomy history and recovery from liver cirrhosis due to schistosomiasis. An intrahepatic splenosis was incidentally found on imaging, while pathological analysis revealed a splenic tissue with cavernous hemangioma. A liver mass was incidentally found on routine exam in an asymptomatic 65 year old Chinese female. MRI scan revealed a left liver lobe lesion (suspected hemangioma) of about 4.2 × 5.6 cm in size. Alpha-fetoprotein (AFP) level was 2.7 (within normal range). Lactate dehydrogenase (LDH) and Beta human Chorionic Gonadotropin (Beta-hCG) levels were all within normal ranges. Surgical records revealed a history of splenomegaly in conjunction with a hepatic schistosomiasis, for which she underwent surgery (splenectomy) at age 20. Physical examinations were unremarkable except for the incisional scar on the upper mid-abdomen due to her previous surgery. Serum chemistry findings including a liver function test were within normal range. Serology for hepatitis B and C were both negative. Her left liver lobe mass was significantly enhanced by contrast with an intact portal vein. The lesion enhanced slowly on arterial phase and the delayed phase with made the diagnosis of a tumor highly unlikely. The spleen was not visible due to her previous splenectomy, and there were neither lymphadenopathy nor ascites noted on imaging. On magnetic resonance angiography (MRA), the lesion was enhanced in segment 3 through the left hepatic artery (Figure 1). Though there were no feeding vessels from the Splenic or superior mesenteric arteries, connecting veins from the posterior to the lesion were noted. Its primary arterial supply was from the left hepatic artery. Her primary diagnosis on admission was "liver lesion," due to uncertainty in the imaging findings, though splenosis was suspected. On admission, she complained of right upper quadrant pain and discomfort which was relieved with rest. She denied significant weight loss and other related discomforts. Figure 1. MRI showing a spleen-like mass at original anatomic location (A). MRA showing intrahepatic venous drainage of the mass (B). Contrast imaging shows intrahepatic artery supplying the mass (C), mass enhanced (D). Sagittal section showing no distinct margin between mass and liver (E). T2WI showing no distinct high signal in lesion (F). Blood routine was unremarkable, Alpha-fetoprotein (AFP), Lactate dehydrogenase (LDH) and Beta human Chorionic Gonadotropin (Beta-hCG) levels were all within normal range. Howell-Jolly and Heinz bodies were not seen on blood smear. Ultrasound and computed tomography could not accurately classify the lesion. Classical features of malignancy were not fulfilled either, nor could a neoplastic process be excluded due to her previous history of schistosomiasis. After revision of an enhanced CT, it appeared that the liver mass did not contrast in the same way as the other parts of the left lobe. Hence, a liver tumor was suspected initially. An oval mass in the left hepatic lobe with unclear boundary was visible on Magnetic Resonance Imaging (MRI). The size was about 4.2 × 5.6 cm, with uneven signal within the mass. T1WI showed a slightly lower signal; T2WI showed slightly mixed signals while DWI showing a high signal. Arterial phase MRA showed a heterogeneous lesion which was uniformly enhanced. No lymphadenopathy was seen around the hilar structures or other related structures such as the stomach, duodenum, subphrenic area or retroperitoneal lymph nodes. Splenosis was suspected from the MRI image due to the unique nature of the mass. Laparoscopic segmentectomy was performed due to the location of the lesion and risk of seeding if the mass was a tumor. Hence a biopsy was not. During the procedure, the mass was noted to be completely engulfed in liver segments 2 and 3 (Couinaud classification). No other masses were found in the abdominal cavity. 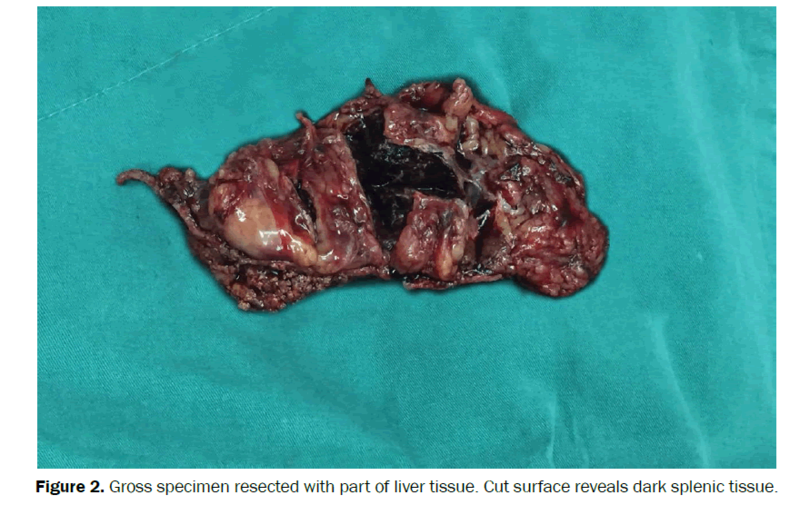 A cut section of the mass after resection showed dark red pulp surrounded by liver tissue with well-demarcated capsule (Figure 3). Pathologic examination revealed sinusoidal structures and lymphoid follicular aggregates distributed around the central arterioles, denoting red and white pulp, respectively, which proved normal functioning splenic tissue with a cavernous hemangioma and small focal necrotic lesions. The patient’s recovery was uneventful, and she was discharged on post-op day 3. Figure 2. Gross specimen resected with part of liver tissue. Cut surface reveals dark splenic tissue. Figure 3.Microscopic demonstration of splenic tissue (S) separated from hepatic tissue (H) by a fibrous septum (FS)(H&E stain, x1 magnification. Imaged cropped via Aperio ImageScope v12.3). Slide Image curtesy of Aperio CS2 Digital Pathology Scanner. Cavernous hemangioma dipicted with (C). Splenosis is often an acquired condition where heterotopic implantation of parts of splenic tissue onto exposed vascularised intrathoracic or peritoneal organs, following splenic injury or elective splenectomy . Although the exact underlying mechanism is not well understood, there have been proposed theories suggesting mechanical trauma and splenic rupture releasing splenic pulp into the surrounding tissues are possible major processes . One common proposed mechanism is hematogenous spread as has been postulated in reported cases of intrahepatic  and cerebral splenosis . Splenosis, therefore, can occur anywhere in the body but is most frequently found in the intraperitoneal space and may be present in as many as 65% of splenic rupture cases . It is important to note that most patients with splenosis are asymptomatic, and abnormality is usually found incidentally, investigation of a separate problem, by a screening test or diagnostic procedure, as seen with our patient and other reported cases . Radiological examinations such as CXRs, CT scans and ultrasounds as well as invasive laparotomies/laparoscopies are all well-documented ways of incidentally uncovering asymptomatic splenosis. When splenosis does show symptoms, it is usually located in the abdominal or pelvic cavity. Splenosis has been documented to can occur with either single or multiple. However, other authors have reported solitary splenic nodules in 24 out of 27 patients with the hepatic splenosis with only one reported case in which the patient had more than three nodular lesions. This may in part bee due to misinterpretation of the results during radiological examination. Sara Jereb et al. mentioned MRI as a preferred diagnostic modality in contrast to CT with respect to sensitivity and accuracy in detecting similar hepatic lesions. In our patient, an internal branch of the left hepatic artery supplied the lesion with its venous drainage via a dilated left hepatic vein as seen in Figure 1. Although diagnostic modality of choice for splenosis is noninvasive nuclear scintigraphy (Technetium-99m), it was used in this case due to cost to the patient. It must be noted that using Technetium-99m heat-damaged erythrocytes (RBC) or Indium 111-labeled platelets which is more sensitive and specific for splenic uptake, are current diagnostic tools of choice . A novel technique for diagnosing selenosis which involves administration of super-paramagnetic iron oxide (SPIO), which is taken up by liver and spleen reticuloendothelial cells, has proven to be effective in differentiating IHS from other lesions . Ferumoxide MRI scan has been shown to be an alternative non-invasive technique . This method uses superparamagnetic iron oxide as a marker by its accumulation in reticuloendothelial tissue for processing . Ferumoxide MRI is employed less frequently and no studies have been published which directly compare its diagnostic sensitivity and specificity to the more commonly used. In general, MRI has significantly been proven to have a better resolution when compared with other imaging modalities and for this reason may be superior in the diagnosis of splenosis . Although Magnetic Resonance Imaging has proven to be superior to CT in diagnosing splenosis, literature has more evidence to support Technetium-99m scintigraphy as the best modality in differentiating it from tumors. There has been very few case reported in which the diagnosis was primarily made with MRI such us in our case. The incidence of intraperitoneal splenosis is under reported because the majority of patients are asymptomatic on presentation and lesions are often found incidentally. In diagnosing hepatic nodular lesions on imagining, splenosis should be considered a differential as this is important in determining the therapeutic approach. Although MRI is superior to ultrasound (US) and computed tomography (CT) in differentiating liver lesions, a histologic specimen needs to be obtained and if possible, biopsy of the lesion to get a more accurate diagnosis. In our case, fine-needle aspiration biopsy could not be obtained due to the location and possible seeding. We however, do not recommend laparotomy as an initial therapeutic approach in part due to complications. We recommend a laparoscopic approach which is considered minimally invasive, as a diagnostic and therapeutic approach for suspected hepatic masses, for possible liver biopsy and or resection. Due to the lack of adequate reported cases, there's no consensus on a gold standard diagnostic approach to hepatic splenosis. However, in most reported cases laparoscopic approach seems safe. In 10 patients review from various literatures (Table 1), only one reported intrahepatic splenosis as the primary suspected lesion . Since the reported case is more recent, we believe clinicwians are becoming aware of intrahepatic splenosis (IHS) as a primary suspected lesion, particularly in the left liver lobe. The majority of cases we reviewed, trauma seem to be the primary cause of splenectomy [2,4-7,12-14]. This is in accordance with literature . We also observed, although not conclusive, that most cases were often diagnosed in patients between their 3rd and 5th decades. This may in part be due to the asymptomatic nature of IHS. Various risk factors such as oral contraceptive use, liver cirrhosis, hepatitis B virus (HBV), alcohol and idiopathic thrombocytopenic purpura (ITP) have been observed in some reported cases (Table 1). Primary suspected lesions were; adenoma, Focal nodular hyperplasia (FNH), hepatocellular carcinoma (HCC) and benign tumors. We, however, did not determine any risk association in this paper. Further research is needed to determine associated risk factors. Surgery and biopsy seemed to be the treatment of choice in most cases as in our case. Table 1. Review of the clinical characteristics of 10 patients with hepatic splenosis. Splenosis should be part of the differential in the workup of patients presenting with pelvic, thoracic, abdominal or subcutaneous nodules with a history of splenectomy or splenic trauma. In some cases, patients might not know the reason for their splenectomy, but detailed history is paramount and should help broaden the clinician’s differential. Once considered, the diagnostic workup for this mostly benign condition is simple, inexpensive, noninvasive, and may prevent future stress and procedures. MRI alone proves useful in the diagnosis of splenosis in the abdominal cavity when the lesion is closest to its anatomy location. Cavernous hemangioma of the spleen, although rare, can develop in patients with intrahepatic splenosis and hence surgery for suspected intrahepatic splenosis as a therapeutic and diagnostic modality is of merit to such patients. We hereby report the first case of intrahepatic splenosis with cavernous hemangioma. Richard D, et al. Splenosis: A Review. South Med J. 2007;100:589-593. Abu Hilal M, et al. 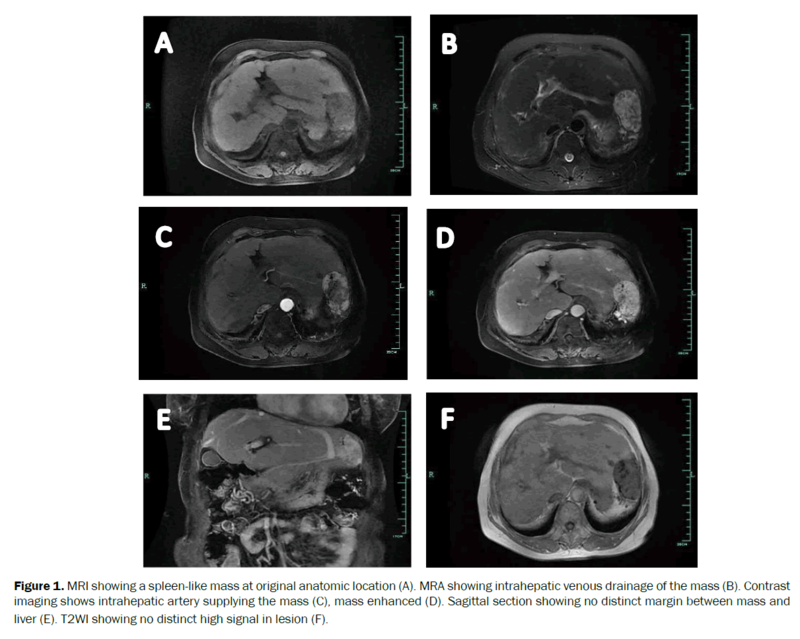 Hepatic splenosis mimicking HCC in a patient with hepatitis C liver cirrhosis and mildly raised alpha feto protein: The important role of explorative laparoscopy. World Surg Oncol. 2009;7:1. Azar GB, et al. Accessory spleen presenting as adenxal mass. Acta Obstet Gynecol Scand. 1993;72:587-588. Al-Ahmadi M, et al. Splenosis of the mesoappendix: Case report and review of the literature. J R Coll Surg Edinb. 1998;43:200-202. Yammine JN, et al. Radionuclide imaging in thoracic splenosis and a review of the literature. Clin Nucl Med. 2003;28:121-123. Huang AH and Shaffer K. Case 93: Thoracic splenosis. Radiology. 2006;239:293-296. Adrales G and Gadacz TR. The spleen. Maingot’s abdominal operations. New York: McGraw-Hill; 2007;1075–1096. De Vuysere S, et al. Intrahepatic splenosis: Imaging features. Abdom Imaging. 2000;25:187–189. Mescoli C, et al. Hepatic spleen nodules (HSN). Scand J Gastroenterol. 2010;45:628-32. Marcan M, et al. Segmentation of hepatic vessels from MRI images for planning of electroporation-based treatments in the liver. Radiol Oncol. 2014;48:267-281. Toktas O, et al. Intrahepatic splenosis after splenectomy performed for idiopathic thrombocytopenic purpura. Ulus Cerrahi Derg. 2015;31:247-249. Jereb S, et al. Hepatic splenosis mimicking liver metastases in a patient with history of childhood immature teratoma. Radiol Oncol. 2016;50:212-217. Rosenberg RJ, et al. Dual radionuclide subtraction imaging of the spleen. Semin Nucl Med. 1985;15:299-304. Sato N, et al. Intrahepatic splenosis in a chronic hepatitis C patient with no history of splenic trauma mimicking hepatocellular carcinoma. Am J Case Rep. 2014;15:416-420.